This Pulitzer Prize-winning novel is arguably my very favorite book of last year—and I read a LOT. The (anti)-hero of this smart, accessible novel is a gay writer making a hilarious, ill-planned world tour invented upon receipt of his old flame’s wedding invitation. Greer tackles everything from the ridiculous world of publishing to the ridiculous American abroad, from the very nature of language to the very nature of love. The book reads as satire but the warmest, most appealing satire you’ve read in ages. We will delve into the deep appeal of contemporary writers, (looking, briefly, for resonance and contrasts with Fitzgerald and Sedaris and Coates). I sense this smart and charming gem will be a favorite of seminar-goers, who will join me in hoping Greer might have a whole trilogy up his sleeve. 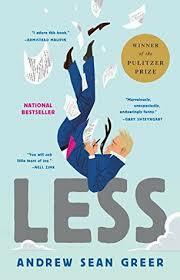 A copy of Less is included in the price of the Seminar and should be picked up at Kepler's (and read) prior to the meeting date.